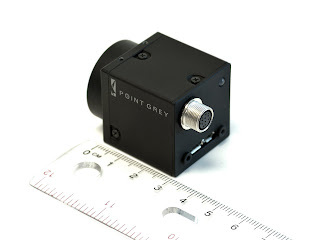 Digital camera experts Point Grey have developed the world's smallest USB3.0 camera. Measuring just 29 x 29 x 30mm, the FL3-U3 is designed specifically for the demanding requirements of machine and computer vision applications. The first available models are based on monochrome and colour versions of the Sony IMX036, a high-quality CMOS sensor capable of generating 3.2 megapixel images at 60 FPS. With a practical limit of 384MBytes/s, USB 3.0 is almost 10 times faster than USB 2.0 and 5 times faster than FireWire-b. The increased data throughput and improved 4.5W of power delivery further makes USB 3.0 well-suited for many of the high-speed, multi-megapixel area scan image sensors on the market today. Most laptop, desktop, and embedded systems now provide USB 3.0 ports, which maximizes system compatibility and minimizes the need for add-in PCI or PCI Express interface cards. Easy access to high quality, low cost components like cables and hubs also allows end users to lower the overall cost of their systems. The FL3-U3-32S2 (1/2.8-inch 2080x1552 at 60 FPS) is priced at $795.